From 1914 until 1915, there were games played in a third major league called the Federal League. It consisted of eight teams, four in established MLB baseball cities and four in cities that were more fringe, but still had a rich baseball history. In the inaugural season of 1914, some teams had nicknames and some did not. Chicago was one of the teams without an established nickname, so the sportswriters came up with the Chicago Federals, or Chi-Feds for short, to distinguish the team from the American and National League franchises. The Chi-Feds managed to land a few choice names from the other leagues, including manager Joe Tinker, who enjoyed success with the Cubs. Others, like Addison Brennan, who had played with the Phillies the past four seasons, were well known commodities. Still others, like Jack Farrell, only had major league experience in the Federal League. Owner Charles Weeghman, who made his fortune in fast-food lunch counter diners, built a stadium for the new Chicago team in the Lakeview area of Chicago in 1914, called Weeghman Park. When the Federal League folded, Weeghman bought the majority shares of the Chicago Cubs and moved the team into the now vacated stadium, just in time for the 1916 season. This is one of the very few examples of Chicago Chi-Feds period cards. Federal League players were only issued in a few sets during the league's existence. One of the main reasons why this card is one of my favorites is the positioning of Ad Brennan. You can clearly see the logo on the uniform in the picture. Add in the iconic status of the set itself and this is a recipe for success. Fielder started his MLB career in Brooklyn on April 18, 1896, for the Bridegrooms, which would eventually become the Dodgers. In 1901, Jones he jumped from the Brooklyn Superbas to the Chicago White Sox, after the American League had newly declared itself a major league. 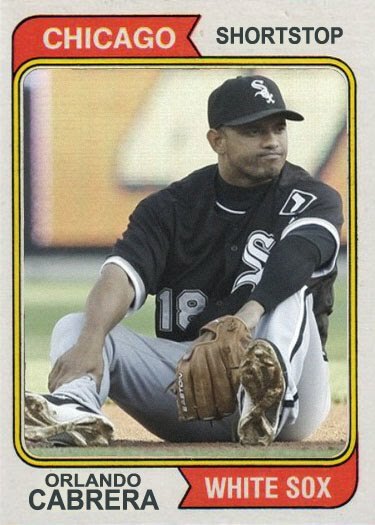 At age 29, he was pulling in $3,000 a season playing center field for the White Sox. During his eight year tenure with Chicago, he finished in the top ten of many categories defensively and offensively. In 1902, Fielder led the AL in singles with 150. In 1905, he led the AL in defensive WAR, with 1.5, tied with his teammates George Davis and Lee Tannehill. Jones helped the White Sox claim the first American League pennant, as a major league, in 1901. On June 5, 1904, Fielder took over the reigns from Nixey Callahan, becoming the third manager in White Sox history. 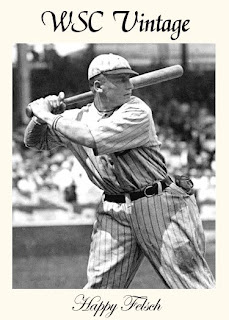 He played and managed his way to the World Championship over the crosstown rival Cubs in 1906. "This should prove that leather is mightier than wood", Jones exclaimed after the series win. Hanging up his Sox after the 1908 season, he played and managed the Chehalis Gophers of the Washington State League, Class D, in 1910. 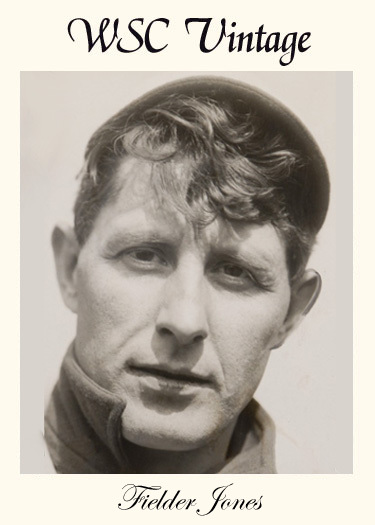 He also was a player/manager for the St. Louis Terriers in the short lived Federal League from 1914 until 1915, finishing .01 percent behind the Chicago Whales for first place in its last season. Fielder finished up his managerial career with the St. Louis Browns from 1916 until 1918. I'm always fascinated by Canadian cards, especially when they have an American counterpart. Add in the fact that this is a food issue and an oddball, and I'm sold. Actually, you had me at Canadian. Je suis toujours fasciné par le Canadien cartes, surtout lorsqu'ils ont un homologue américain. Ajouter dans le fait que c'est un problème alimentaire et d'un des, et je suis vendus. Effectivement, vous m'a fait au Canada. I can admire Early Wynn. He gutted out 23 seasons, from 1939 until 1963, with some of the most electric stuff. He had a reputation of being intimidating and was stubborn enough to stick around long enough to win his 300th game. Granted, it took seven starts, over nine months, spanning two seasons, with two different clubs, but he did it. Je peux admirer Early Wynn. Il a vidé les 23 saisons, de 1939 jusqu'en 1963, avec certains des plus electric stuff. Il avait la réputation d'être intimidant et était têtu assez pour s'en tenir assez longtemps pour gagner son 300e match. Accordée, il a fallu sept mises en chantier, plus de neuf mois, s'étalant sur deux saisons, avec deux différents clubs, mais il n'a. Early may have been the nicest guy, for all I know, but he was known as a fierce competitor. I just wouldn't want to meet him in a dark alley, even today. He died in 1999, and I'm pretty sure he could still kick all of our butts. Early de mai ont été les plus belles guy, pour tout ce que je sais, mais il a été connue comme un farouche concurrent. J'ai tout juste ne serait pas envie de le rencontrer dans une sombre ruelle, même aujourd'hui. Il est décédé en 1999, et je suis presque certain qu'il pourrait encore kick tous nos butts. A Hall of Fame player, who has a colorful reputation, on a vintage Canadian food issue oddball card? Sign me up! Le Panthéon player, qui a une réputation coloré, sur un millésime canadien alimentaire des carte? Inscrivez-moi! J'ai pas étudié le français depuis le 6e année. Si la traduction est légèrement off, blâmer le traducteur en ligne. No one ever questioned the ability of Orlando when he was on the South Side. He hovered around his career averages in most categories during 2008. The unraveling of Cabrera's Pale Hose career was slow, but spectacular. Orlando played along, in the beginning. He joked around in White Sox commercials and went about his business, saying the right things and doing an above average job at the plate and in the field. Then the cracks began to appear. Cabrera started arguing repeatedly with skipper Ozzie Guillen. He left the clubhouse early on multiple occasions to avoid the press. Orlando also called the press box on at least two occasions to have his errors overturned. He questioned the winning attitude of his team. The final straw came during the 2008 ALDS, when he kicked dirt at Rays pitcher Grant Balfour, during an at-bat. In the two years following his departure from Chicago, Cabrera has played for the Athletics, Twins and Reds. Floyd made his MLB debut on April 25, 1943, against the Browns, in St. Louis, at Sportsman's Park. He entered in the seventh inning and promptly gave up a hit and two walks before finishing the inning. Speer may have been in line to work the eighth, but the game was called after the seventh inning, with the White Sox behind 5 to 1. He would have to wait for another opportunity to pitch in the big leagues until nearly a year later, on April 23, 1944, in St. Louis again, against the Browns, in the first game of a double header. This time, entering in the eighth, he fared much better, striking out one and throwing a 1-2-3 inning. Once more fortune struck Speer, as he entered a game in the eighth on May 3, 1944, in Cleveland, against the Indians. In what would mark his final MLB appearance, he gave up two runs on four hits, facing six batters, but completing the inning. 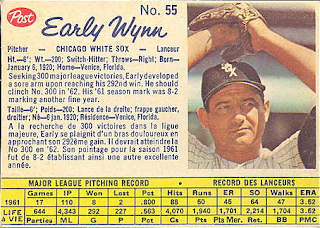 His minor league career was much more successful, lasting sixteen seasons, from 1938 until 1953, posting a record of 189 - 131, with a minor league career ERA of 3.84. Deep within the bowels of whine and cheese country came a package, out of the blue, that can only be best described as relief. A package from a certain Thorzul who must have drugged a certain coach Ditka that guided the Pack to victory today. Maybe it would have helped if a certain Michael Jordan tried his hand at his third sport in the Windy City. Sure, it hurts. Maybe not as much as landing on a bicycle with the seat missing, but it hurts. Enough about other sports, we're here to talk about baseball. And being that the majority of Wisconsinites that I've met are genuinely some of the nicest people you ever will meet, except for those who believe cow tipping is sport, I had waves of warmth and joy when I opened this mailer from Thorzul. Frankly, I wasn't sure what to expect when I saw the return address. The last box that I sent Thorzul's way contained many cards from his want list, but also a specialized gift that could have been considered a dubious act, if viewed in the wrong light. I stand by it and viewed it as a loving prank between friendly bloggers, meant to bring confused laughter and wonderment. Apparently, it was taken as intended because along with the Peavy pictured at top, these also arrived. Thanks, Thorzul! Not only did I like these cards, I absolutely adore the numbered Fisk card! It's sad that the Bears won't be going to the Super Bowl this year and that the Packers are, but if my consolation prize are these cards, I can live with that. This time. The 1937 issue of O-Pee-Chee featured a combination reminiscent to the 1934 Goudey set and the Batters Up set from 1934-36. The black and white action photos are featured on top of a stylized ballpark background. Vernon Kennedy was a fantastic choice for a subject. He was coming off of a 1936 season where he won 21 games, threw 20 complete games, pitched 274 1/3 innings, and made the All-Star team. 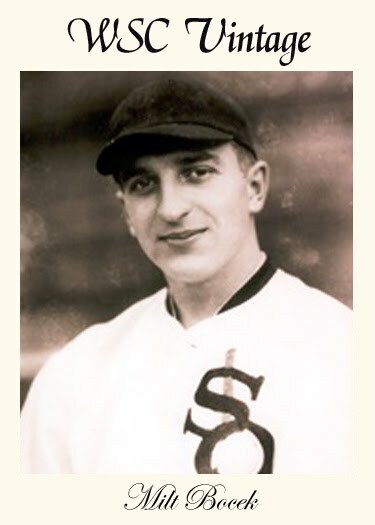 1937 would be his last season with the White Sox. 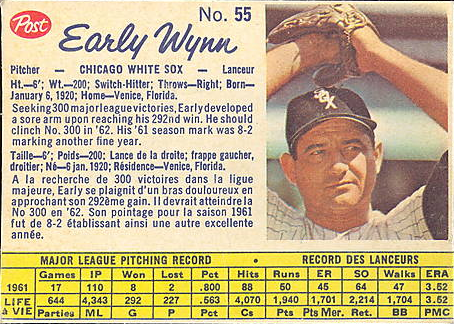 Among his accomplishments with the White Sox, one stands out above the rest, his no-hitter on August 31, 1935 against the Cleveland Indians. 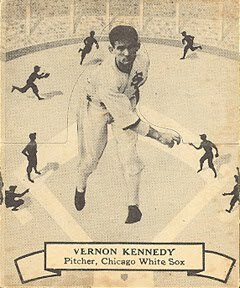 Vern's no-hitter was the first thrown in Comiskey Park. The card may not look like much, but this was a popular style for cards back in the thirties. A few modern sets have tried to replicate this style, but nothing beats the original. There's minute details in the original card that modern reproductions usually lack. Even the carefully laid shadows billowing off the silhouettes and accenting the grand stand poles in the background say a lot about the amount of detail that the original cards show off. Javier is a dominant pitcher. He could be an ace if it wasn't for his knack of folding under pressure. 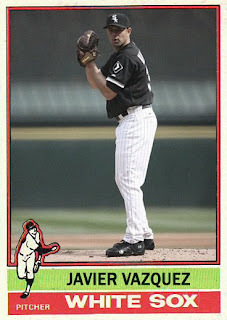 Vazquez was traded to the White Sox from the Diamondbacks for Orlando Hernandez, Luis Vizcaino and Chris Young before the 2006 season. Javier was expected to step up and win in a nurturing setting. Vazquez did step up, but not before succumbing to the sixth inning. When the team was out of contention, Javier was able to produce his best work with the Sox. 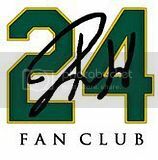 2007 was his best season, with a record of 15-8, which is a career best winning percentage. Unfortunately, the Sox were an underachieving team that year. 2008 marked his final season with the White Sox. It started promising enough, but Vazquez was pulled from the lineup during the stretch, when the Sox were fighting for a playoff spot. Javier imploded in the postseason against the Tampa Bay Rays. He was traded to Atlanta after the 2008 season. The first pack of a new year is always a special and momentous occasion. Despite the best efforts of the card companies Topps, there is usually one pack that beats all: Phungo cards. This is, if I'm not mistaken, the third year I have had the privilege to open a pack of Phungo cards. It has become a ritual that I look forward to doing. This is the best way to start the new year of collecting! Let's rip this puppy open! We start off the new year by reliving one of the worst moments of last year. The singing cowboy part-time umpire always manages to enrage players and fans alike, wherever he goes. From the side he reminds me of a weeble. Nice selection of former and current White Sox players. A secret passion of mine. It's like this pack was specifically geared towards me! A smattering of traditional cards from 1973 to 2010! Another former White Sox, who is still beloved in Chicago, despite playing for a rival. I seriously doubt that any pack can top this one for 2011. I will have to break out a Phungo-meter to judge all future 2011 packs. While Bocek was a student of the University of Wisconsin-Madison, his glory at the amateur level in baseball and softball caught the attention of then White Sox manager, Lew Fonseca. Milt was given a tryout at Comiskey Park where he proceeded to launch several balls into the upper deck. "Beltin' Bo from Cicero" had impressed those who witnessed the tryout. Milt signed with the White Sox during the summer of 1933 and made his MLB debut on September 3rd of that year. He lived up to his reputation on September 24th, when he hit his only career home run off of the Indians' Thornton Lee, in the second game of a double header at Cleveland Stadium. 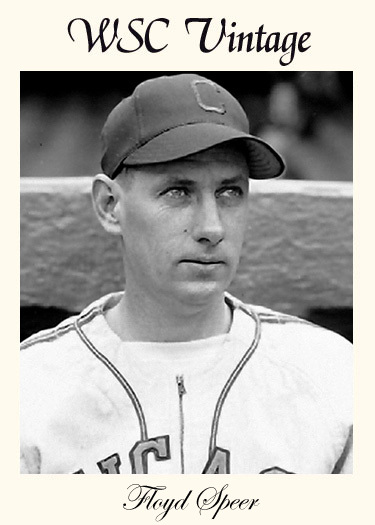 Bocek played sporadically throughout 1934, before his final MLB game on August 2nd in St. Louis. Until his death, at age 94, in 2007, he held the distinction of being the oldest living White Sox player. The primary reason for this card selection today is that at some point today, one billion seconds will have passed since one of the strangest brawls in baseball history. It just happens to have involved Ed Farmer. Chris Jaffe tells the story much better and is also the one who informed me about the milestone. Thanks, Chris! The gist of the story is that on May 8, 1979, Ed Farmer, while with the Texas Rangers, hit Kansas City Royals leadoff batter Frank White in the hand, which broke. Frank White ended up missing a month. Four innings later Farmer hit Al Cowens in the face, breaking his jaw. Fast forward to over a year later on June 20, 1980. Ed Farmer had been traded to the White Sox during the previous season. Al Cowens had been traded to the California Angels in the offseason, but was traded again to the Detroit Tigers on May 27, 1980. Each player was on a different team and was facing each other for the first time since the beaning. Ed Farmer relieved Britt Burns with two out in the tenth inning and got Alan Trammell to fly out Chet Lemon in center field. Ed Farmer returned in the top of the eleventh to face Al Cowens. Cowens grounds out to Todd Cruz, at shortstop. The ball is thrown to first baseman Mike Squires for the out, but Al never reaches the bag. He never even runs towards first base. Instead he runs directly at Ed Farmer for a little payback. One billion seconds will pass sometime tonight since this oddity happened. And to think, if it wasn't for Chris Jaffe at the Hardball Times, I would have never known. It all started innocently enough. A poem inspired by a less than stellar hit on Christmas morning. The hit itself was pretty decent, but the subject left a bad taste in my mouth. Such is the life of a White Sox fan. Yankees fans may adore Nick Swisher, but the Sox fans grew tired of his antics and pouty behavior. He crossed many a South Side fan when he would rather brood in the dugout, due to a lack of playing time, rather than cheer on his teammates. White Sox fans can live with embarrassing shenanigans. 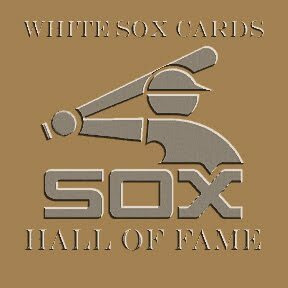 We've endured the inspired lunacy of Bill Veeck, the miscalculations of Steve Dahl, the mouth of Ozzie Guillen, the surliness of Albert Belle, Frank Thomas and a number of other personalities. The one difference between all of those people's affiliation with the White Sox and Nick Swisher's season on the South Side was work ethic. Chicago fans can embrace quirkiness, buffoonish behavior and unfiltered commentary, as long as there is some blue collar ethics behind the eccentricities. All of the players sent over by BA Benny's Baseball Card Buffet fit this criteria. Let's start with the card that began the trade. A 2006 Bowman Heritage bat relic of Jermaine Dye. I know the front of the card says Game-Worn Jersey. The back says Game-Used Bat Relic and that's exactly what is in the little "B" window. This is a great swap for a Nick Swisher Yankees Game-Used Uniform. 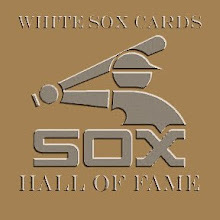 In addition to the bat relic, there were 2003 Finest cards of Paul Konerko and Bartolo Colon, a 2009 Topps Heritage short print of Jermaine Dye, a 2010 Topps Gold card of Jake Peavy, 2010 Upper Deck cards of Matt Thornton and Freddy Garcia, a 2006 Upper Deck card of Jim Thome, a 2008 Goudey card of Luis Aparicio, 2009 A Piece Of History card of Carlos Quentin and Jim Thome, and a 2009 Topps 206 card of Gavin Floyd. Thanks, Mike! These were awesome! It surely beats a non White Sox game-used card of Nick Swisher any day! Let's just get this disclaimer out of the way first. 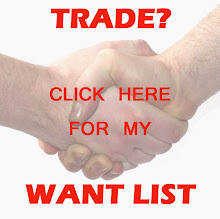 The holidays hit like a ton of bricks and I've had to put off many trades. I haven't forgotten about the pending trades, but I've been bouncing all over the place lately. Those of you waiting, expect an e-mail from me this week. If you don't hear from me, please e-mail me to give me a swift kick in the behind, you know, as a friendly reminder. This trade from Spiegel came together rather quickly. He sent over some White Sox cards and I sent over some Dodger cards. Something tells me that my Dodger cards will soon be as depleted as my Met cards. That's OK. They all go to good homes. It just makes further trading a little more challenging. Which is a good thing. Let's just say I was floored to find a Sammy Sosa gold winner card in the stack of cards sent over. When I was a teenager, I could have picked this card up for a quarter or less. It was only as high as a quarter because of the gold foil, which was a novelty back then. After switching sides in Chicago, Sammy's cards tended to skyrocket in value and stay up in the stratosphere for a long time. They are finally starting to come down, but the cards are still priced too high, in my opinion. Others may debate that for eternity. I'll leave that to them. I'm just happy that another card is crossed off my list. There were other cards sent in the package. A well loved '82 "In Action" Fisk, which received some love when I featured it in the Tops of Topps list. That's always a great picture of Carlton diving for the ball with his mask tumbling below him. A retail Ultra SE of Bobby Jenks from 2007 was in there. As well as a few more cards off the want list from the mid to late nineties. The rest consisted of shiny and non-shiny cards from 2010, including a mini of Rios! Thanks, Spiegel! This was a great trade. I hope you are satisfied with the cards that I sent over. I'm sure we'll be trading sometime in the future. If Mark Teahen doesn't improve enough to instill confidence to either play him more often or dupe another team into giving up prospects for him, he may be useful in a different aspect to the White Sox... as chief surgeon of the White Sox M*A*S*H unit. Even if the Wikipedia entry is true, it's odd and hilarious. Just call him Hawkeye. Thanks to South Side Sox for the heads up! 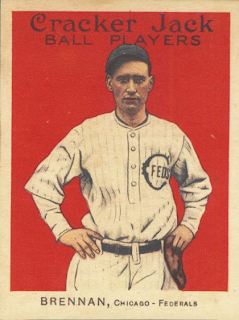 Oscar Felsch made his debut with the White Sox on April 14, 1915. By the following season, Happy ascended into the upper echelon of American League hitters and finished in the top ten of most major batting categories until the end of his career. Felsch missed a great deal of the 1918 season, due to military service, but was right back among the league leaders in 1919. In addition to being a threat at the plate, Oscar was regarded as one of the elite fielders in the AL, and led the American League in putouts and assists in 1919. 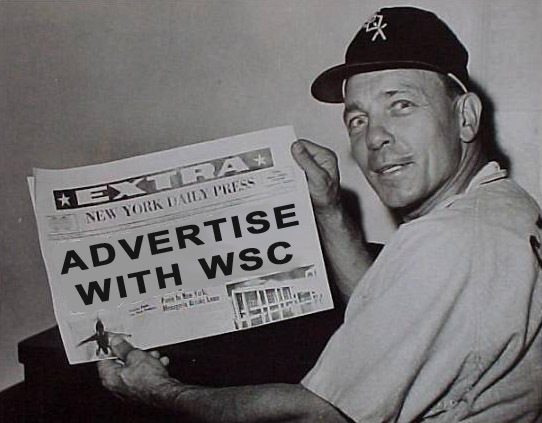 The once promising Hall of Fame career fell by the wayside, when Happy agreed to accept $5,000 for his part in throwing the 1919 World Series against the Cincinnati Reds. The act had a profound effect on both clubs, as each struggled in the mid twenties through the mid thirties. After the 1920 season, Oscar was banned from organized baseball for life, along with seven of his alleged co-conspirators. It should be important to note that these eight men were banned from baseball despite being acquitted of wrongdoing in a court of law. In recent years, evidence has emerged that the 1919 World Series was not the only one thrown. In affidavits produced during the Black Sox trial, it is stated that the idea to throw the 1919 World Series came from knowledge that the previous year's World Series was fixed. If Oscar "Happy" Felsch has any positive legacy, it is that his actions led to the game being cleaned up from gambling. It is debatable how well Happy would have done past 1920, but with the dead ball era waning at the end of his career, it may have been something special. The life of a middle reliever can be a cruel one. People tend to forget about you because you're not a stud starter or a cocky closer. The middle relief usually show up when the starter gets rocked or in a specialty situation. I love the middle relievers. Without that solid bridge between the starter and the closer, most games are lost. They are the unsung heroes on the team. One of my favorite current middle relievers is Jason Frasor. He has never been with the White Sox. He usually crosses my path, off the field, far away from the game, and I've never met the man. I still collect his cards. I've crossed paths with Rob Mackowiak in the same classes in high school, before he sniffed the majors. He was on the White Sox, and yet there's not a strong connection. Jason is different. I've known my fiancee since 1996. We managed to stay connected throughout the years despite her moving away. Eventually the friendship blossomed into the relationship that we share today. Her sister has had a long friendship with Jason's brother. After years of being prompted to "look for Jay" from my fiancee, I finally saw him in a game against the White Sox. I was impressed with what I saw. When I started back into collecting baseball cards, I've always kept an eye out for his cards. Until last month, I've never pulled a Jason Frasor card out of a pack. I went to Target and mistakenly picked up a 2010 Topps Series 2 that was left in the Updates box. I was a little miffed about picking up the wrong series, but a pack of cards is still a pack of cards. I opened it and the first card out of the pack was Jason. Now I can cross another impossible task of my list. Jason had a great start to his MLB card career in 2004. He was all over the place. As card companies wilted and his rookie year faded from view, it got harder to find Frasor in releases. In 2006, only Topps thought to put him in a set. In 2007, Jay would get an Upper Deck Series 2 card and a Topps Update card. In 2008, there were no cards of Jason Frasor, which led me to create this one. 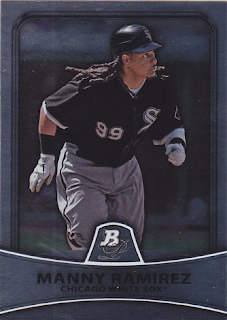 Upper Deck was the only one to include him in 2009. 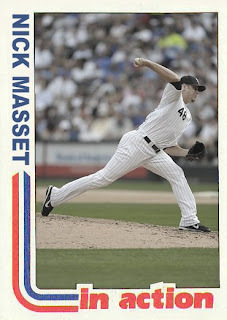 Topps was the only card company to give him a spot in 2010. 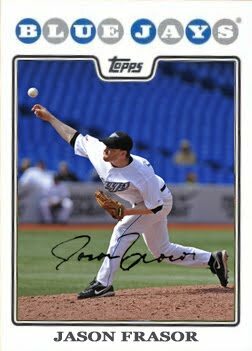 Sadly, we'll never know for sure if Upper Deck had plans for a Jason Frasor card in 2010 Series 2. Here's a victory for all the decent middle relievers. A card that should have been for a solid bullpen guy. In a sign of just how desperate the second base situation was for the White Sox, they traded for Roberto Alomar in consecutive years, in the twilight of his career. His bat wasn't as quick and his defense was a little less spectacular in 2003 and 2004. Roberto was far removed from his years as a perennial All-Star and Gold Glove recipient. Alomar still showed some signs of what made his career great, but he was long in the tooth when he arrived in Chicago. I appreciated Robbie being on the Sox, but like many other veterans that the team acquires, I wish it had been five years prior. 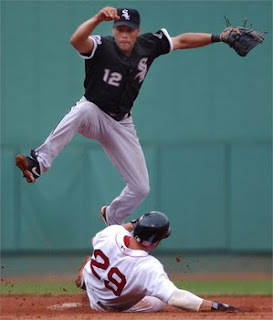 There were leaps and the occasional home run, even a triple in a White Sox uniform. Those are memories that I will cherish seeing. Another Hall of Fame player came through Chicago and stopped for a little while on the South Side. Congratulations, Robbie! You definitely deserved it. The inaugural ballot includes a player for each positional spot on the field, a designated hitter, a manager, and pitching has been split into spots for starter, middle relief and closer. 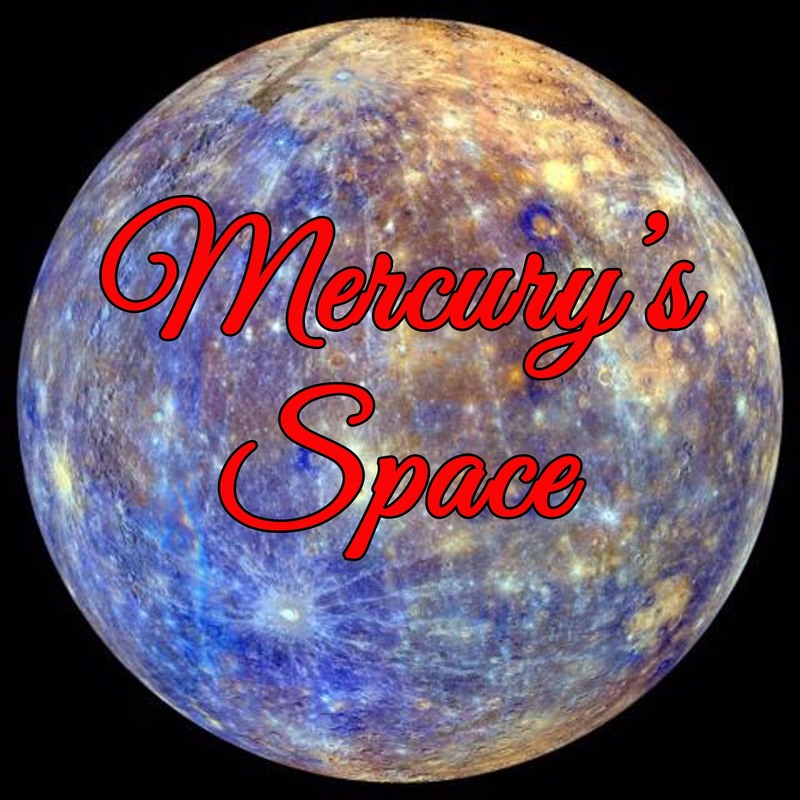 Voting will be through February 14, 2011, with the results announced shortly after. You can vote on the right sidebar. Any position left open due to election or cuts will be filled by another player next year. A bonus card based on the In Action subset from the 1982 Topps card set. Nick came to the White Sox, along with John Danks and a minor league player, from a trade with the Rangers for Brandon McCarthy and a minor league player in December 2006. While with the Pale Hose, Masset was used often, but was swapped between the majors and minors. He languished in the middle relief role, causing a high ERA, but excelled finishing out games in non-save situations. His biggest contribution to the 2008 season was off the field. Nick was part of a deadline trade with the Cincinnati Reds. He and Danny Richar were sent to the Reds in exchange for Ken Griffey Jr., who was well past his prime, but provided key plays that helped decide the division in favor of the White Sox. 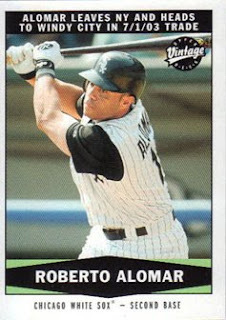 Congratulations to Roberto Alomar, who mysteriously found 126 additional votes in his second try into the Hall of Fame. Most likely due to the idiotic practice of not voting for a player in his first year of eligibility. That hazing ritual by the writers has probably cost a few players the necessary votes at one time or another. It's a great honor for Roberto, but it should have happened last year. For every vote that went to David Segui, Pat Hentgen, Kevin Appier, Eric Karros, Ellis Burks and Robin Ventura, that could have been a vote theoretically filtered to Bert Blyleven and Roberto Alomar in 2010, instead of making them wait for a few votes this year. In the mad rush to get Roberto Alomar elected, did it cost this man his place on the ballot? 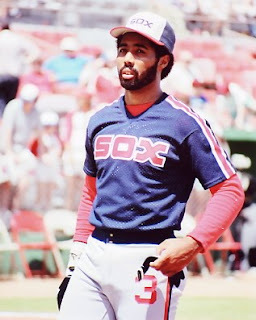 Harold Baines, who had been gaining votes and pulling away from the cutoff line, lost five votes and missed the cut this year. If the two writers that voted for B.J. Surhoff had switched their votes to Baines, he would have survived the cut this year. Harold's eventual fate will be left in the capable hands of the Veteran's Committee, which is like letting the cat look after the pet mouse. It's not likely to end well. Part of the fallout from only one major company producing licensed baseball cards in 2010 is perceived laziness. That notion is certainly on display in Bowman Platinum. There really isn't a reason for this product. There are more autographs and collegiate cards, but other cards during 2010 have done both better. The base set is a sleek 100 cards and is almost an afterthought. Topps seems more interested in giving Upper Deck a giant raspberry by creating a foil board base set, than at really creating an innovative or even a competent product here. This is an ugly child, whose parents seem to be SP and Finest. Nothing on the card suggests that it should be part of the historic Bowman line. 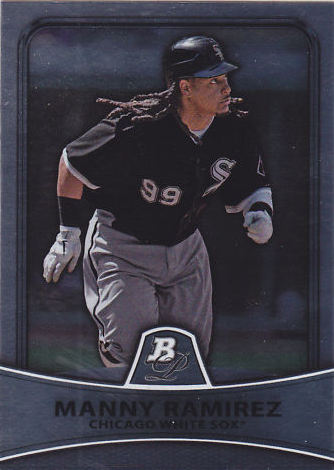 The only saving grace of the base set may be Manny Ramirez's first card in a White Sox uniform, which may also be his last. The White Sox have three cards in the 100 card set. There is no need for this set. I'm hoping that the plan for 2011 is better for Topps. 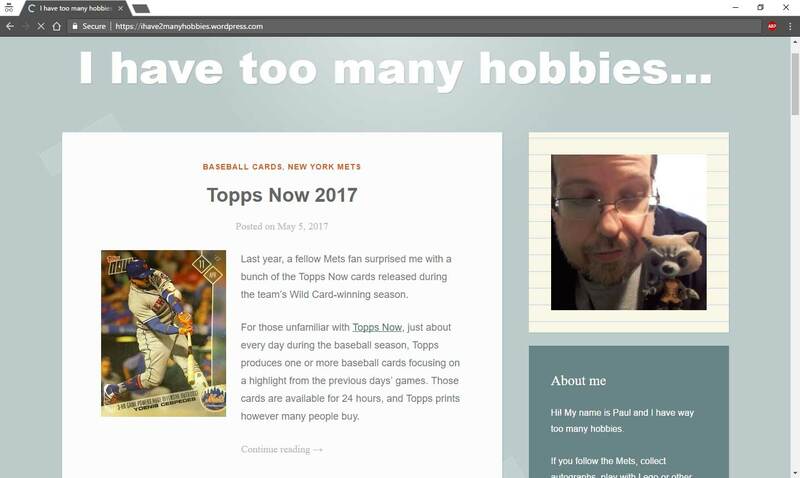 Many collectors are already bored with much of the product that has come from Topps since the fall of Upper Deck's baseball card division. Topps may be in danger of putting those same bored collectors to sleep.